NYC is Blue: Droga5 Hired as "Lead Creative Agency"
AdWeek is reporting that NYCFC has hired an advertising agency to begin the process of branding and marketing. New York City Football Club has hired Droga5 as its lead creative agency. NYCFC is the newest team unveiled by Major League Soccer, and the league's 20th. It is jointly owned by by English Premier League team Manchester City Football Club and the New York Yankees, which together purchased the rights to NYCFC for a reported $100 million this spring. Manchester City FC is owned by a group of investors led by Sheikh Mansour bin Zayed Al-Nahyan, a member of the Abu Dhabi royal family. 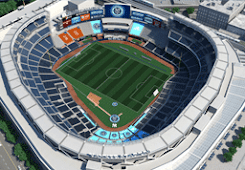 NYCFC is the second team in the New York Metro Area after the New York Red Bulls, which play at the Red Bull Arena in Harrison, N.J.
NYCFC is expected to start playing in the 2015 MLS season. It does not yet have a permanent home stadium, but its owners have been exploring possible sites to build one, including in Queens. Droga5 will help NYCFC with work like fan activations as the nascent team builds its brand. "In Droga5 we have found the ideal partner to help us establish and grow New York City Football Club," said NYCFC CEO Ferran Soriano, in a statement. "While they have a global perspective, they are also locally rooted in New York, ensuring proper understanding and communication with our fans in this great city." Droga5's headquarters are in New York City. The agency also has an office in Sydney, and this year opened shop in London. "As an agency of people who both live for football and love New York, the branding and launch of our city’s first MLS team is a dream project,” said Jonny Bauer, Droga5's chief strategy officer, in a statement. No indications yet if Droga5 will be handing the general marketing, kit and crest design, or both (I'm still pushing for Hyperakt's crest concept). The agency's client list is very impressive but doesn't include any sports teams. It should be very interesting to see what they come up with the club.